For many students, graduation is a celebration of accomplishment and hard work. For Sebastian Araujo, a recently graduated senior at Canoga Park High School, graduation was also a celebration of family history, heritage and immigration. 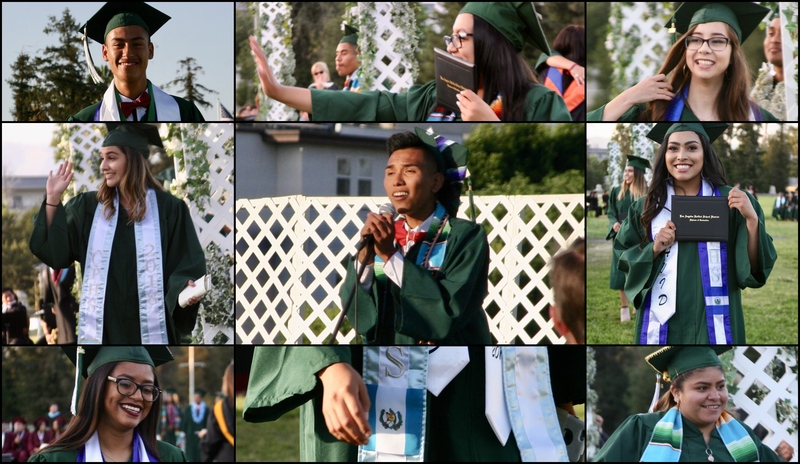 The ceremony, held for graduating students of both Canoga Park High School and Owensmouth Extension School created an environment for new generations of Americans to receive their high school diplomas, an opportunity that their parents and relatives did not have. After seeing videos of ICE agents destroying the water volunteers had left in the desert for immigrants, Araujo wanted to find a way to raise money to replace the water that had been destroyed while allowing his classmates and community to show pride in their immigration stories. A project that was originally intended to be a gift for a friend become an event called Cultural Sashes where students and teachers were able to buy sashes that represented the countries they immigrated from to wear at graduation. The money raised from the sashes will then go to buying water, which he and a team of students, teachers, and parents will take to the desert in between San Diego and Tijuana on June 16. From his project, Araujo has sold 150 sashes, far exceeding the number he had expected given his small student body and opposition from the principal and administration. For students, the sashes offered room for them to take pride in their family history. Graduate Yecenia Garcia of Guatemalan descent dreams of majoring in political science to ultimately become an immigration attorney, like Araujo. Newer generation Americans are able to witness the effect that the stigma surrounding the immigrant community has and are called to help others, much like their families, be allowed the opportunities of American citizens. The advocating does not stop at immigration. What makes the United States the “land of the free” is that those who consider America their home are able to fight for every cause that deserves justice and stand for anything they feel deserves attention. Araujo is inspired by every protest and demonstration in his fight for equality. With the stigma around immigration, it is easy for people to forget the humanity of the immigrants that come to America in pursuit of the American Dream. For Araujo, this project is not the end of his fight for immigrants’ chance to achieve their dreams. Can you please correct the last name in one of the pictures from Cynthia Cabrera to Cynthia Becerra? Please and thank you.